IT goes without saying - that no writing-table in a drawing-room ought to betray a familiar touch. It is not the place for private correspondence, for bills, memoranda, or for any personal possessions proper to a desk or a writing-table in one's private apartment. The writing-table in the drawing-room is purely and solely for the convenience of the visitor, for the notes he may want to write when he has come in to leave a message in your absence, for the address you may want to take down as he gives it to you, and only in an emergency for the note that you yourself may wish to write. It should always have its portfolio of more or less elaborate design. The one in the illustration shows a back of cut silver on a leather ground. The blotting-paper should be spotless. Either in the portfolio or in a separate box, of silver, brass, or leather, there should be note-paper, envelopes, and a pad. Stamps should always be provided, for while the good taste of the visitor ought to control his use of them, the forethought of the hostess should never put him to the embarrassment of having to look for one. The inkstand and pens should be looked after daily with the same care that is expended on the saltcellars. 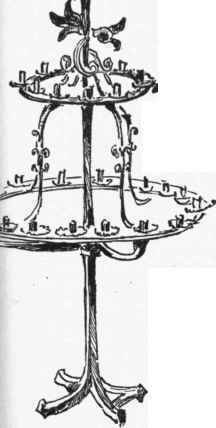 The inkstand may be of silver, brass, or even of crystal. The one seen in the illustration happens to be a gem of its kind, inlaid with turquoise and fine enamel, but every-day mortals may content themselves with simpler devices. The flowers conceal the electric lamp, but no writing-table should be without a light for writing at night. It should always have flowers, and when possible some interesting object which relieves the table of an office-like character. A bronze base stands on this one. Paper-cutters and letter-openers should never be forgotten. As many persons prefer sealing-wax to mucilage for their letters, it is generally customary to provide a small candle, matches, and sealing-wax. A small silver spoon, especially designed for the purpose, is now sold for the sealing-wax. The spoon is held over the flame of the candle, and when the wax is melted it is poured over the envelope, in this way avoiding all danger of a fire or a burn. Some of these spoons are elaborate in design and interesting objects in themselves. The writing-tables of living-rooms and libraries are often of great size, when a room itself is large enough to contain them. Thus, there will be one of oak with dimensions so ample that two well-sized chairs can be drawn up by it, and two complete sets of writing materials be placed upon it, without interfering with each other. 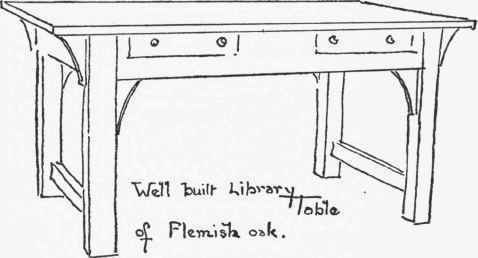 When such a table is of light oak, brass instead of silver is effective for inkstand, paper cutters, and candlesticks. When a writing-table is pushed up in a corner, between a window and a blank wall, the light coming in at the left, the whole corner can be most delightfully treated by building up over the table on the blank wall-space. Thus, rows of book-shelves may be made to run up, surmounted by a bust; or a picture of exceptional beauty may be placed there, an altar lamp suspended from the ceiling above. Any one unable to purchase a good writing-table can treat an ordinary pine table with oil, directions for which are given under a separate chapter. In many small country houses and studios, such a table will serve every purpose. It can still have a good cover, cut to match its top, and it can be set out with its proper appointments and its flowers. When the legs of such a table are square, they can be covered with a brocade or a cretonne, nailed on with brass-headed tacks, the same material being used as a cover. 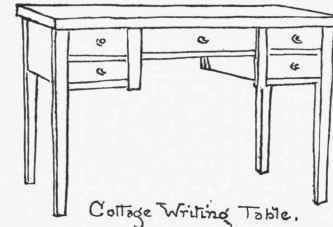 Very many writing-tables have no covers. One sees this in beautiful libraries, where the table is of genuine old oak, waxed, never varnished. Sometimes a blotter with silver corners is placed; sometimes the portfolio is so large that when spread open the blotting-paper inside acts as a softening surface on which to write. A very good table cover is, however, made of dark invisible green velveteen, exactly fitting the top of the table, and trimmed about the edge with a gilt gimp sewed flat. This velveteen sets off silver or crystal. The cover seen in the illustration is an old piece of embroidery out of some palace, and is in keeping with all the other appointments about it, - the carved table, the bronze, the silver vase of exquisite workmanship, the rare old inkstand, and the hanging on the door. Pieces of brocade are used in the same way. In fact, one may be as extravagant as one chooses without offending the proprieties, providing only that one breaks no law of good taste by displaying the tawdry. With simple leather or brass one may do without silver and still make the writing-table interesting. One should neglect none of its requirements. No upright piano should cut across a corner, with its keys toward the room. I make special insistence upon this point, recalling as I do the numbers of diagrams sent me from all over the country, in almost every instance showing me a piano cutting the corner of a room. Few things are more awkward. The empty corner can never be filled, and a constant view of the keyboard is not beautiful. The customary way now followed is to place a piano at right angles to a wall, its keys in this way concealed. In conventional high-stoop houses with front and back parlors, the piano stands in front of one of the windows, its keys to the right. The back of the piano is then draped with a piece of rich brocade. Against this, at one end, is a table set out with photographs and silver frames, a lamp and flowers, the piano making a background for the table. This table is not for decoration only, but for the convenience of persons occupying the sofa, pushed flat against the wall, and coming, therefore, at right angles to the piano. The top of the table is generally covered with a piece of rich brocade, which, however, does not fall over its sides. Sometimes the piano is put into a corner and lighted with candelabra. A small sofa is then drawn up in front. Such an arrangement brings it at right angles to the open fire; while the musician at the keys is concealed, the general effect is greatly enhanced. When it is necessary to have the keys exposed, much interest is added to the general composition by a pair of tall cathedral candlesticks set on the floor on either side of the seat. The piano no longer is allowed to overpower the room in which it stands. The long-established rule about its position of importance in a room, its being kept without anything on its top, the turning of its keys so as to make them the most conspicuous features in an apartment - all these old ways of doing have departed. It is all well enough for a public performer to sit so that an audience may have an uninterrupted view of his fingers, for an audience wants to know how a musician plays; but in everyday houses and lives, music is for the entertainment of a family circle, and but small contributions to that entertainment are made by a view of a timid or embarrassed player. Besides, there is always a little touch of mystery and sentiment lent to a player concealed behind the keys. For that reason the fashion has grown of concealing the keys of an upright piano. Very often, instead of a piano-stool a carved bench out of some foreign church is used, so that many young women when playing might well remind one by their air of Saint Cecilia. Cheap silks on the backs of upright pianos are always to be avoided. China silks and printed stuffs looped and tied in impossible knots are very objectionable. The handsome scarf shown in the illustration is an old altar-cloth of white satin, embroidered in gold and silver as only those old nuns understood the art. But it would be better to have no hanging than to substitute a piece of cheap material for this, which is purely ornamental in its character. When some piece of stuff serves a purpose of utility, the case is altered. It may be as plain as necessity requires. For that reason one may put a piece of China silk or figured material on the back of an upright piano, if one has nothing better to use in its place, because the back of an upright piano must be concealed to be made endurable, the wires and works showing, as they do not in the case of a grand piano. When the keys of a grand piano are toward a wall and the end projects into the room, it is customary to throw over this end any beautiful piece of embroidery which one possesses. Sometimes the finest of old brocades are used in this way, - never anything of wool, or coarse enough in texture to scratch. A fern or a vase of American Beauties will hold the embroidery in place. A small sofa is often placed at the end of a piano, especially when the end reaches the mantelpiece, so that two persons may sit with their tea-cups by the fire while a "tuneful melody" is being played just back of them. This is a favorite way of arranging old-fashioned drawing-rooms in New York, where the fireplace is in the centre of the wall directly opposite the door, the dining-room opening by folding-doors in the back. The space between the folding-doors and the mantelpiece is generally utilized in this way for the grand or square piano.